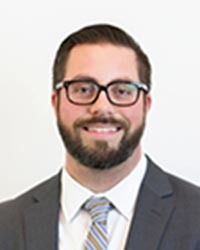 Christian Swol has been named to the newly created position of Director of Alumni and Community Engagement at the Cleveland Leadership Center. In addition, he will develop new initiatives to connect and engage alumni more deeply with community projects that yield positive change. CLC currently has more than 7,000 alumni – including Swol, who is a member of the Cleveland Bridge Builders Class of 2016. About 600 individuals complete a CLC program each year, adding to the base of alumni prepared to make an impact. A survey of alumni last year underscored that they are primed to expand their impact. Alumni from all CLC programs responded to the survey, reporting they believe strongly that CLC programming was significant in shaping their attitudes, practices and behavior regarding leadership in the community, and that they feel confident and capable to engage in civic roles. Swol comes to CLC after serving as Program Manager for east side outreach for Youth Challenge, which brings together young people with physical disabilities and teen volunteers who inspire each other through adapted sports, recreation and social growth activities. He has also worked in operations and IT positions in Cleveland in banking and higher education, and with the volunteer team at Hospice of the Western Reserve. Among his community involvement is serving on the Collaborative Administrative Council, a member of the Euclid/Hillcrest Collaboration, the Quality of Life Committee of Northeast Shores and a trustee for the East Shore Park Club. He also has served on the Cuyahoga County Advisory Committee on People with Disabilities. A Cleveland native, he received his MBA from the Weatherhead School of Management at Case Western Reserve University and a bachelor’s degree in management from John Carroll University. He lives in North Collinwood with his wife and two children.